Jay Kemp has learned a thing or two in his 25+ years in the lighting business. 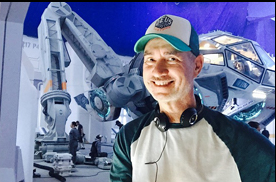 His credits as a gaffer or rigging gaffer include Captain Philips, Lincoln, Cowboys & Aliens, and The New World, which means he has collaborated the likes of Barry Ackroyd, BSC; Janusz Kaminski; Matthew Libaticue, ASC; and Emmanuel Lubezki, ASC, AMC. Jay says that Foederer wanted to define a basie koolkit and stiek to tas much as possible. They tested a wide range of lighting tools, many of them unfamiliar. It was predetermined that they would use strictly LED and HM technology, with the exception of some KinoFlo units and practicals in a few sets. superior performance, as well as their relative portability. The HMIs, often with various degrees of CTB added, provided the needed blue screen exposure, as well as a cool ambience to enhance the scenes. Markus preferred that the shadow information render on the cool side, so incidental blue return from blue scenes was embraced to a degree.